Leaving the streets of Huskisson behind, you follow the String of Pearls, a series of white sand beaches separated by rocky headlands and/or stretches of coastal forest. One of them, Hyams Beach, boasts the whitest sand in the world. It is a good place to stop for a coffee before heading on to cross the dunes and turn inland. Wandering through the heathlands and forests of Booderee National Park, a small detour takes you to a view of Lake Windermere, a large perched fresh-water lake, before you pick up a log stretch of quiet gravel road. 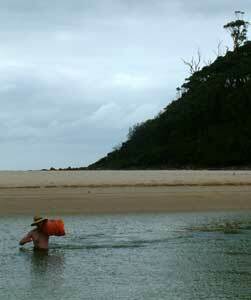 This follows the reed-lined shores of St Georges Basin beneath eucalpts, cabbage palms and tall tree-ferns. At road’s end is Christians Minde, a small privately-owned enclave within the national park and across the channel lies the fisherman’s village of Sussex Inlet. The channel is deep and can have swift-flowing tidal currents, so the only way to cross is by pre-arranged boat trip with the local boat hire people. From the canal estates of Sussex Inlet, you walk across the old forest-covered dune systems to emerge on the soft golden sand of Cudmirrah Beach. You continue southwards along this isolated beach with the soft roar of the surf in your ears to reach the entry of Swan Lake. 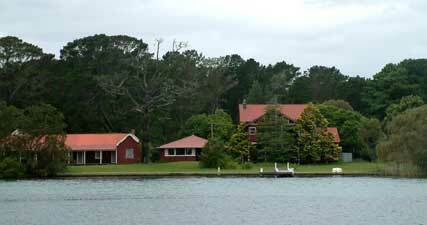 This is a good overnight spot, as the tranquil setting of the lake makes a great contrast to the wildness of the beach. From Swan Lake, you wander through the sleepy villages of Cudmirrah and Berrara to regain the beach at Berrara Point. 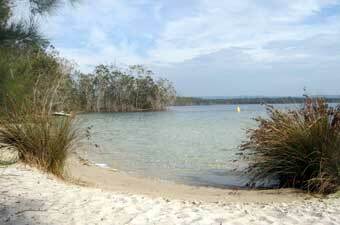 For the next few kilometres you walk along the sandy beach, backed by the heathlands of Conjola National Park. The route continues on beach and forest road past the villages of Bendalong and Manyana to reach the northern shore of Lake Conjola, which cuts deeply into the hinterland forest. Here, a deep wade or swim across its mouth is needed to cross to the southern shore-line. More beach-walking along the fringe of Narawallee Creek Nature Reserve brings you to Narawallee Inlet and another, albeit shorter, wade. The next section is more developed as you pass through the coastal towns of Mollymook and Ulladulla. However, there are some lovely sections of sandy beach, tidal rock garden and heath-topped headlands to pass. One, Ulladulla Head, has a cultural loop featuring wood carvings by local aboriginal people that illustrate their history and culture. The harbour of Ulladulla, with its fishing fleet, marks the end of this section. The only track issue in this section is that you need to briefly cross Christians Minde, a private enclave within Jervis Bay National Park, in order to reach Sussex Inlet. Permission should be sought or a general right of passage negotiated.